Fall is here! This savory filling goes well with the sweet squash. There are a lot of ingredients, but you just dump them in so it’s not hard to make. I hope you enjoy it! This is a great fall dinner! Looks pretty too. Cut the acorn squash in half lengthwise, and scoop out the seeds. Rub a bit of grapeseed oil all over the squash, inside and out. Place cut side down on a rimmed baking sheet and bake for 30 minutes or more, until soft when poked with a fork. Meanwhile, in a large saute pan over medium heat, brown the ground pork until no longer pink. Remove the meat from the pan, add the grapeseed oil and saute the onion, celery, and carrot until they begin to soften, approximately 7 to 10 minutes. Return the pork to the pan along with the cooked rice, spinach, pine nuts, oregano, worchestire sauce, tomato paste mustard, and salt and pepper, to taste. Stirring constantly, heat mixture thoroughly, approximately 2 to 3 minutes. Remove from the heat. Divide the mixture evenly among the squash, and top with cheese if desired. Bake again until heated through, and the stuffing and squash is golden on the edges. Hi Amber, it’s Mia. 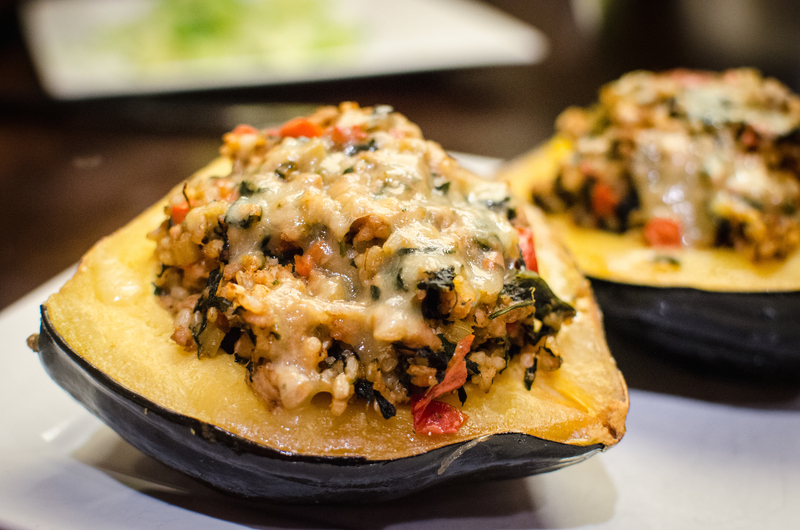 The stuffed acorn squash looks delicious!!! I will definitely be making this recipe!!! By the way, do you have a good caramel apple recipe??? If you do, do you mind posting it??? I have tried many caramel apple recipes off Food Network even, though they turned out REALLY runny. If you get a chance that would be greatly appreciated!!! !